In a whirlwind of action and danger, peppered with instances of magic, Master Athina by Danny C. Estes comes to a gallant close. For four books we have followed the journey of Jim, construction manager from our world into the body of Athina; lady of another world. Jim’s evolution into Athina as a full human being has been carefully crafted and readers should be satisfied with how things have come to pass. Our poor Athina has lost the voice of Jim but retained his knowledge and parts of his personality. It is as if they have melded to become a new Athina. Unfortunately, as we have well learned, Athina does not have an easy life. Our story picks up a short while from where it left off. Athina is happily married and is about to have twins. She has learned that her entire existence was not two souls switching occupation in her body, but one soul that has lived two lifetimes. This revelation is incredible in that it takes the struggles Jim had in being in a young woman’s body and feeling out of place and brings about the idea of reincarnation and multiple lives. Estes does a great job in slowly, but surely, melting the two into one throughout the course of the Athina series. There is only one disappointment in this book and that is the very few spelling errors that pop up now and then. It doesn’t take away from the story, but it is a sharp distraction in a series that has obviously been crafted with care. Athina has been born into a world where her greatest short coming is the fact that she is a woman. There is much she cannot do because of her gender and it shows in her frustration when the rebuilding of her home commences. She clearly has the knowledge to be a master builder, yet she is not allowed to. Athina does obtain her Master title, however, in a discipline that might come as a surprise to readers of the series. It is a title that she wears with confidence and brings about some unexpected conversations. The action scenes in this novel are still well written and important to the tale. There is no action just for the sake of action which can be a downfall for many fantasy-adventure stories. Estes knows his craft and he has definitely had the time to hone it. 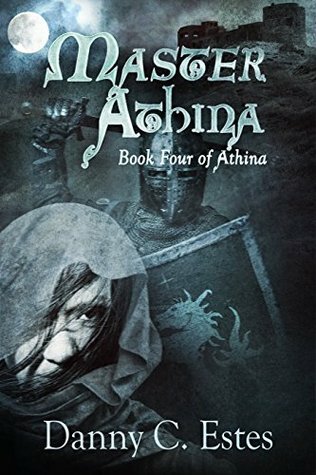 Master Athina opens with a helpful and refreshing prologue which considerably compresses the events in the previous books. This is great for those who have gone a long time between installments and need a refresher, or for those who are picking up Master Athina without reading the predecessors. This final installment in such a thrilling adventure that wraps up the journey nicely and should satisfy all curiosity while leaving bits for the imagination to go wild over.